Our job is to navigate changing markets and we use technical and macro analysis to identify major market turns amidst periods of conflicting signals, emotional markets and often high uncertainty while staying keenly aware of risk to our thesis at any give time. 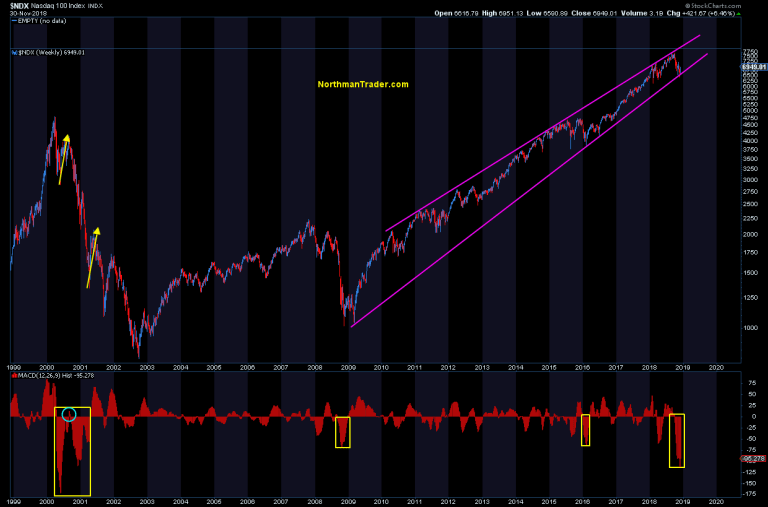 In last weekend’s Bear Trap we discussed the technical signals that suggested a large rally could unfold and outlined some of the macro triggers that could light a fire under these markets. “Bears watch out” I stated. 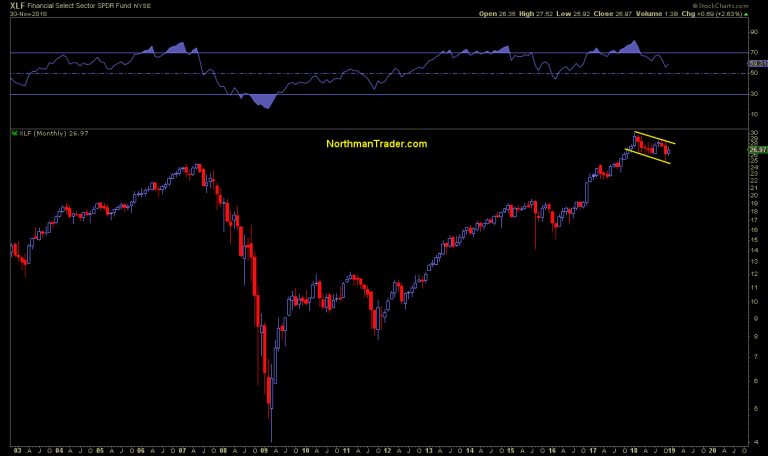 Indeed US markets responded with the strongest weekly bounce in 7 years as one of the triggers, the Fed, came through. 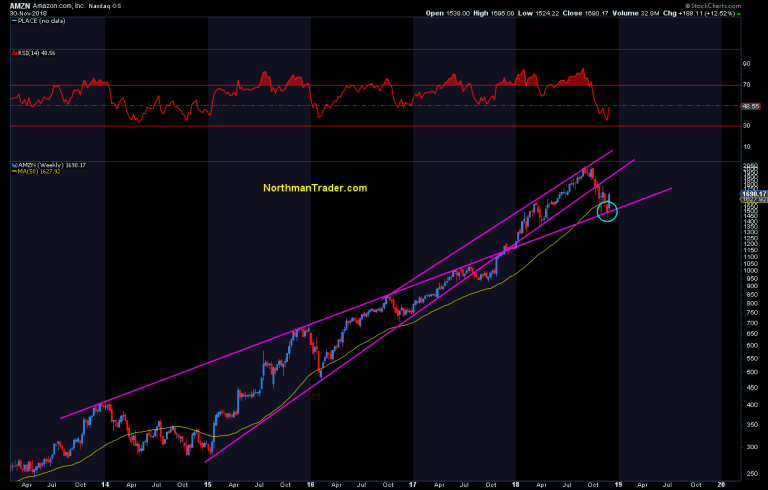 A second trigger may have been pulled this weekend (China) giving markets license to rally further. 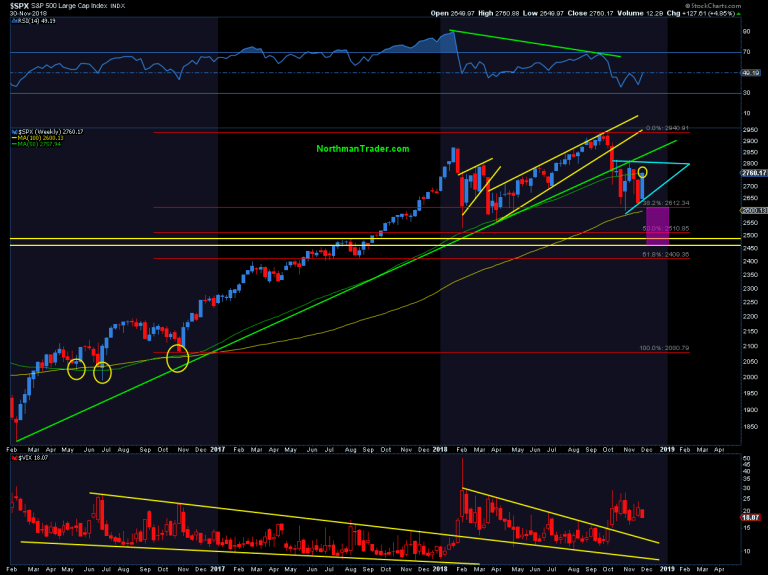 In this edition of the Weekly Market Brief I’ll review the facts and then outline some going forward considerations. Let’s start with the technicals. An over 5%, 130+ handle move off the lows in a matter of days. One could argue that the internals have yet to show a dramatic improvement and that may be a red flag. But fact is the wedge pattern has remained very clean technically speaking as of now and a break above would suggest higher prices to come. 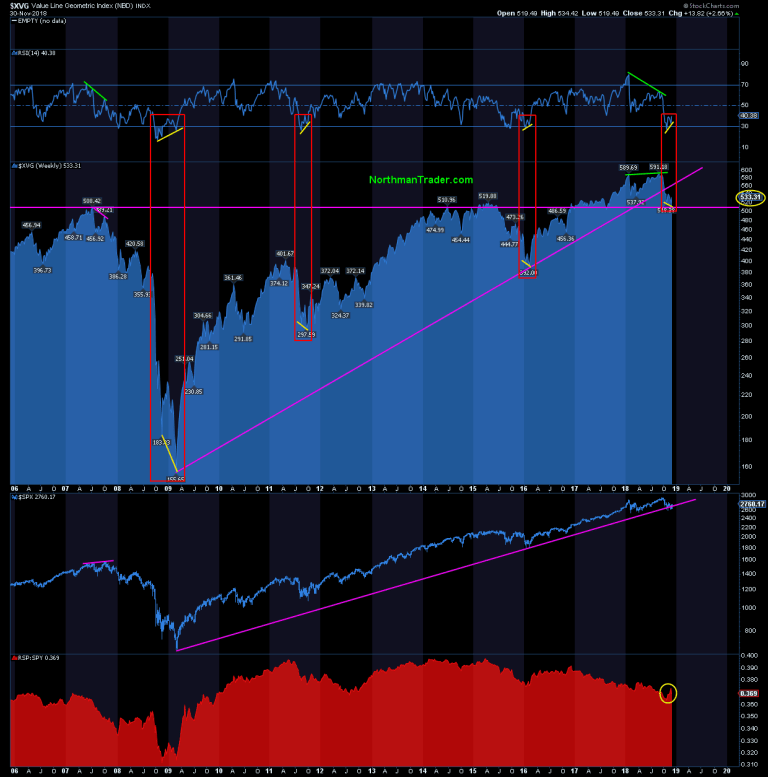 This chart is still vastly oversold and suggests it has a lot of potential room to rally higher still. 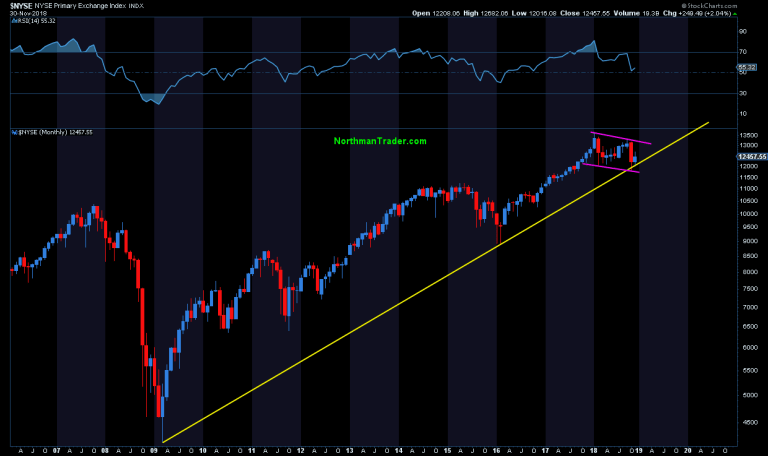 As you can see the monthly trend line also held last week, an important consideration going forward. I’ve outlined several of these trend line saves in “Saved Again” yesterday and you can see them there. So let’s hone in on some reality here: Bears have failed to break these trends for now. Trend lines have held, even in individual stocks such as $AMZN. 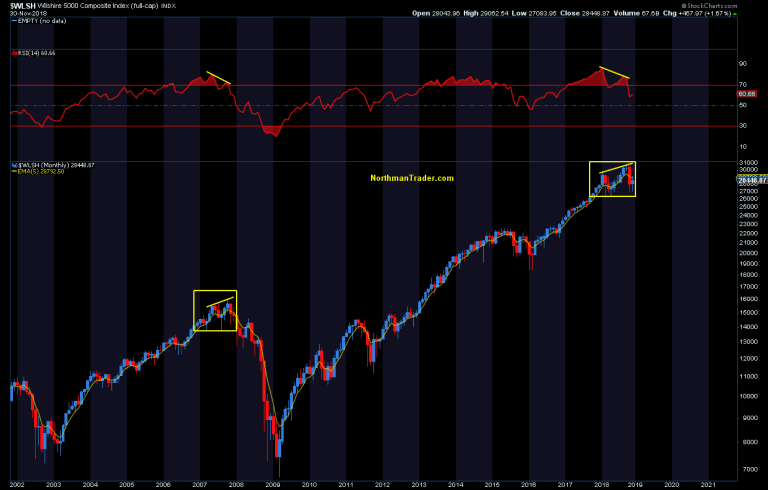 After all, the 2009 trend line has held twice and the monthly 20MA (the middle monthly Bollinger band) has also held twice as support. Big support confluence. 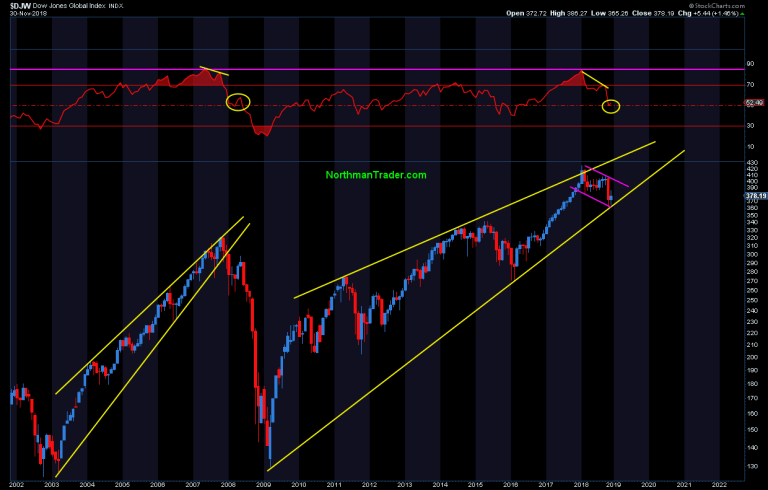 So why not new highs, especially if the macro tiggers go in favor of bulls. And from the looks of it they are. Let’s start with the Fed. Really? REALLY? A month ago the Fed was all confident and insistent on their rate hike schedule. 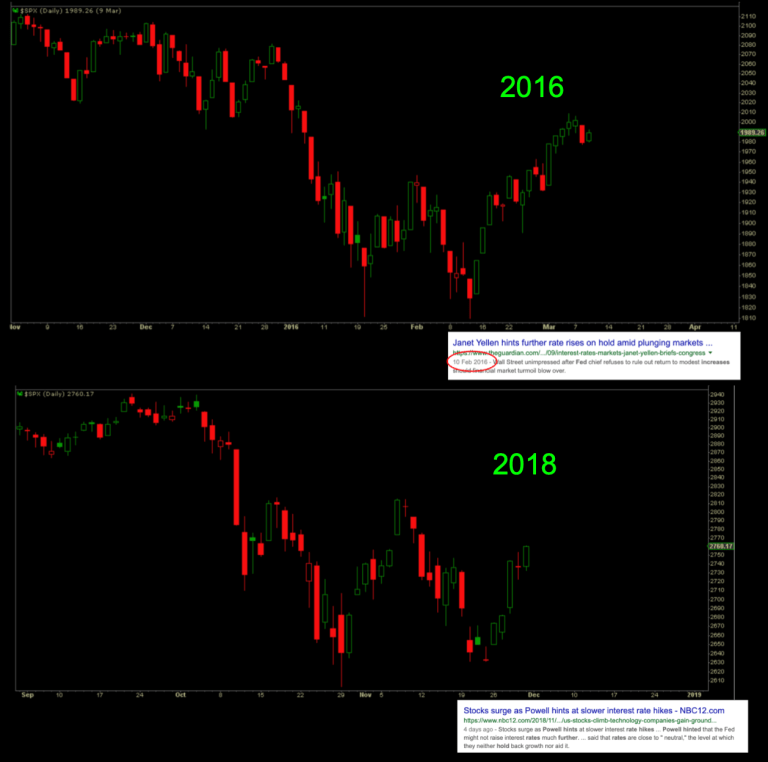 Just like Janet Yellen was in December of 2015 during her first rate hike only to cave 2 months later after markets were dropping firebombs everywhere. Her caving came after the January counter rally failed and stocks were dropping again into February. Powell just caved after the October counter rally failed and stocks were dropping again in November. So either this is a giant coincidence or Powell just pulled a Yellen at precisely the same time giving markets again a license to rally. In The Summit I stated: “Trump needs a perceived win”. Now he has one and is positioning it as such even though there is no deal. Just a truce or pause perhaps. 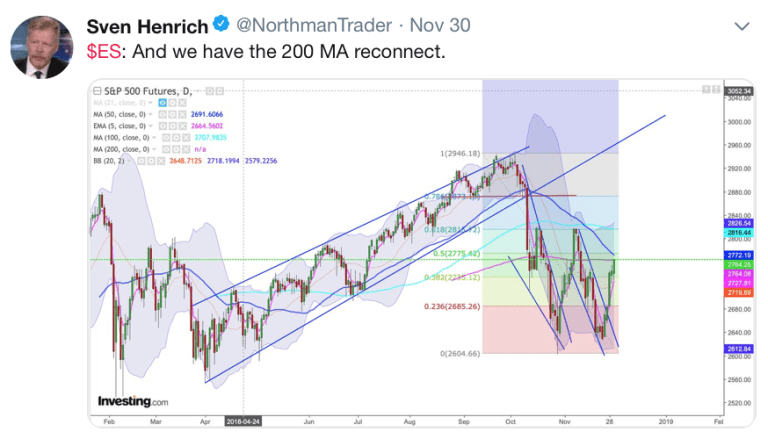 Bottomline: Speaking technically, and in context of the now emerging triggers, bulls have now a license to rally this market and they could rally it all the way to new highs into Q1 2019 with the prospect of a positive China deal hanging as a carrot in front of them. It’s possible. But there are major hurdles and risks ahead. For one Brexit deal approval has run into major roadblocks in the UK and European markets clearly want a resolution on December 11. OPEC is meeting on December 6th and oil markets remain in a major funk. Then there remains event risk as it pertains to the President himself. His former campaign manager, his former attorney and his former National Security Advisor are all in major legal trouble. Manafort is in jail already, Cohen just plead guilty to lying about Trump’s business interests in Russia and Flynn is expected to come clean on Tuesday in his plea. The president’s twitter feed has been pre-occupied about the Mueller investigation in recent days. Things continue to brew there and pose headline risk. Tuesday of course is December 4th and seasonality suggests that the first two weeks of December can be shaky. After all a larger gap up into early this week may bring about short term overbought readings. Tax loss selling is a consideration as well as are multiple points of resistance and open gaps ahead. After all liquidity is still being drained from the system, growth is still slowing, no definite China deal has been accomplished and earnings comparisons will still lag in 2019. 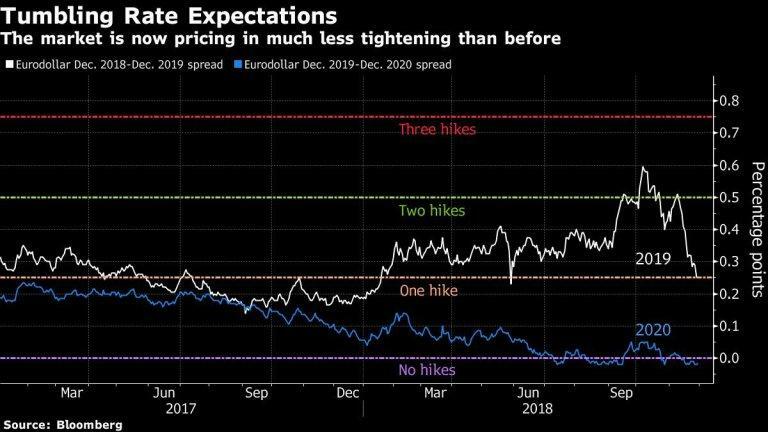 Hence the Fed’s efforts last week may ultimately turn out to be ineffective and only delay the perhaps inevitable: That these trend lines will eventually break for good to the downside. 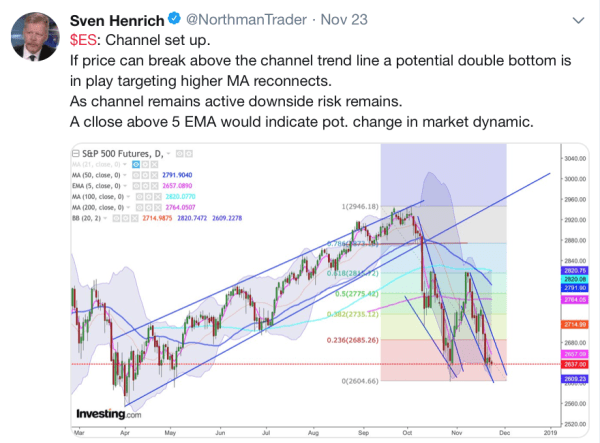 Is the risk zone we outlined still applicable in 2018? 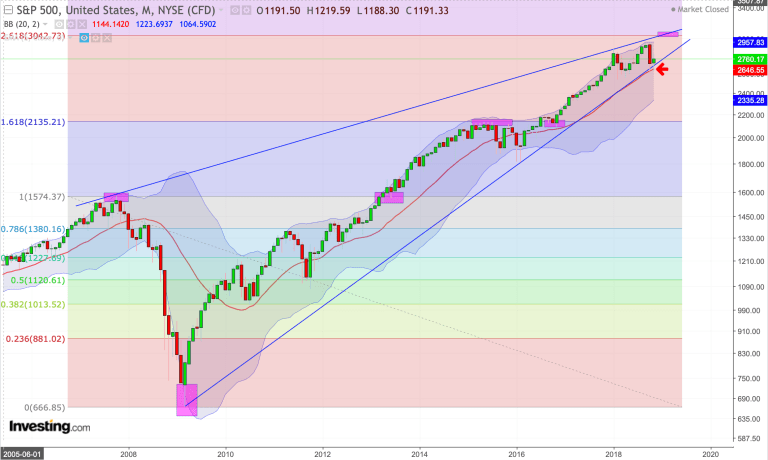 With higher lows in place and only 4 trading weeks left in the year it seems highly unlikely frankly, but not without precedence. That year too had a double top with weakness into October and November and the late November/early December rally fizzled into new lows. Back then that turned into a 2 day affair before a major rally into January which also produced lower highs before the recession unfolded. That’s one year out of the past 19. Not exactly an encouraging historical precedent for bears. But to prove their case bears need lower lows. And so far they have failed miserably. 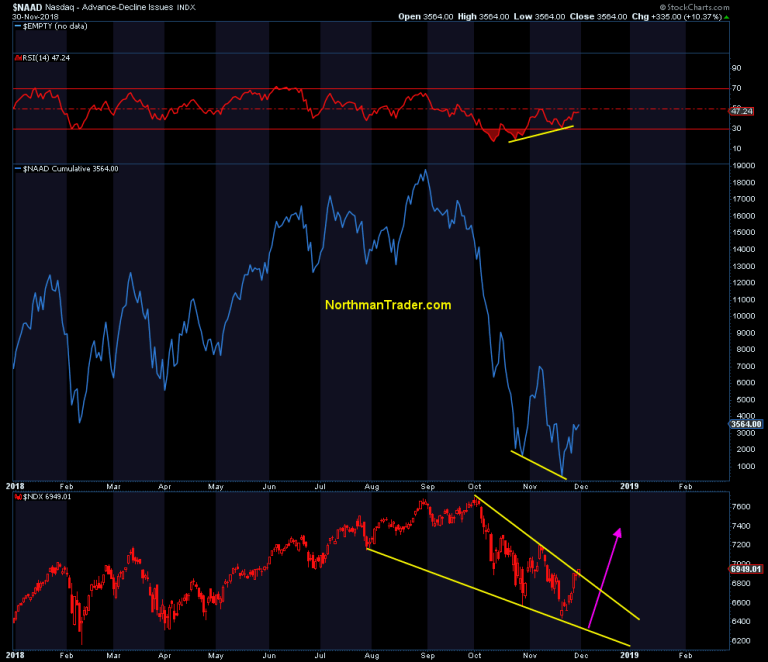 Outlook: Last week’s massive rally and indicated further strength have so far supported the Bear Trap scenario. We’ll be reaching short term overbought readings into early December just ahead of traditional short term weaker seasonality. There likely will be some fade/retest trade opportunities. Indeed bulls need to avert a sell the news scenario. 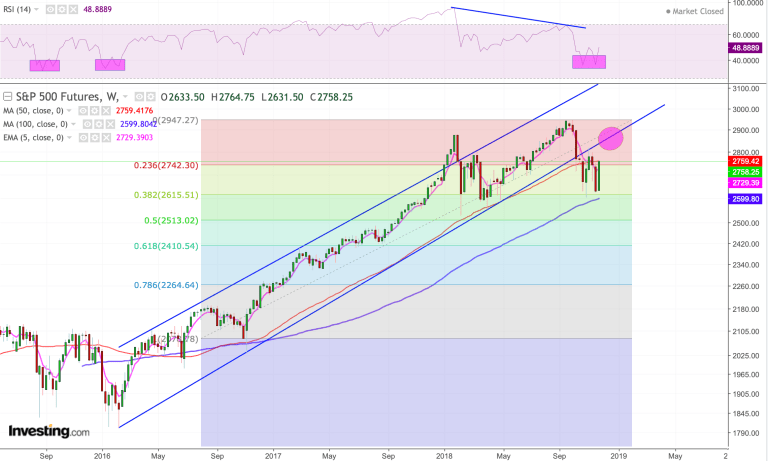 A renewed drop below 2700 would constitute a major warning sign for bulls. 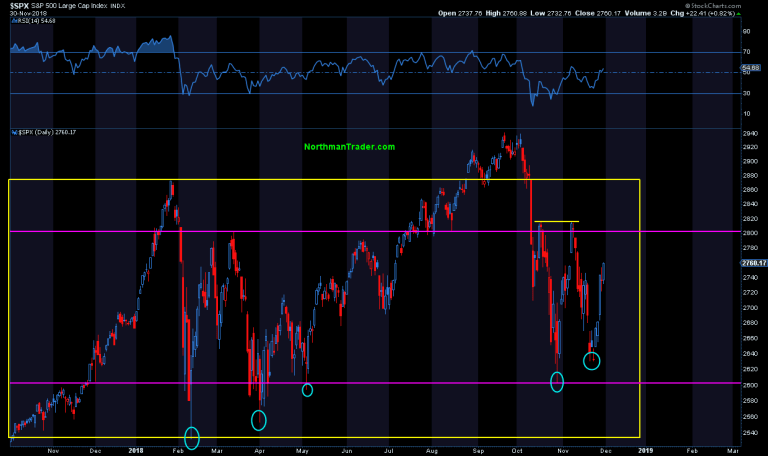 A drop below the October/November lows would fully open up the lower risk zone again. Headline risk and technical resistance remain part of the market’s make-up. But bulls have been given a license to rally these markets into year end. They better not fumble this or this setup turns into a bull trap fast.